I had to walk past City Hall to a dentist’s appointment yesterday. For months (actually, years off and on!) the Market Street shortcut behind City Hall has been blocked off by scaffolding erected to preserve/shore up the nearly 120-year-old structure. I almost automatically walked farther west to Water Street, which would have added a good five minutes to my trip, before I realized the scaffolding was gone. 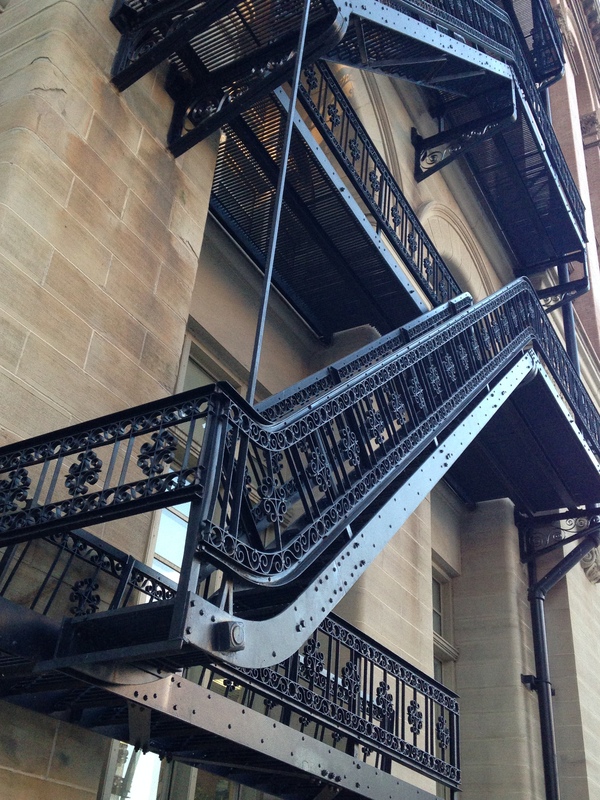 So yesterday, with the scaffolding gone, I noticed how attractive the actual fire escape is up close. It doesn’t even look like a fire escape. So ornate! I love Milwaukee’s City Hall. And I fear it is doomed. Here’s a New York Times article from last June that lays out the whole depressing scenario pretty well. We’ve no sooner finished (for now) all the exterior repairs than we now have to turn our attention to the fact that it is slowly sinking into the swampy soil that underlies our entire downtown. Downtown Milwaukee’s buildings rest on pilings—mostly wood, in the case of older structures—so dry rot is a major concern. How much is a building worth? At what point should we stop throwing good money after bad? City Hall is such a beautiful piece of architecture. An instantly recognizable landmark. An icon, really. Kind of like the Empire State Building or the Eiffel Tower or the Sydney Opera House. It’s hard to put a cash value on something that has a greater intrinsic worth than merely the sum of its deteriorating parts. 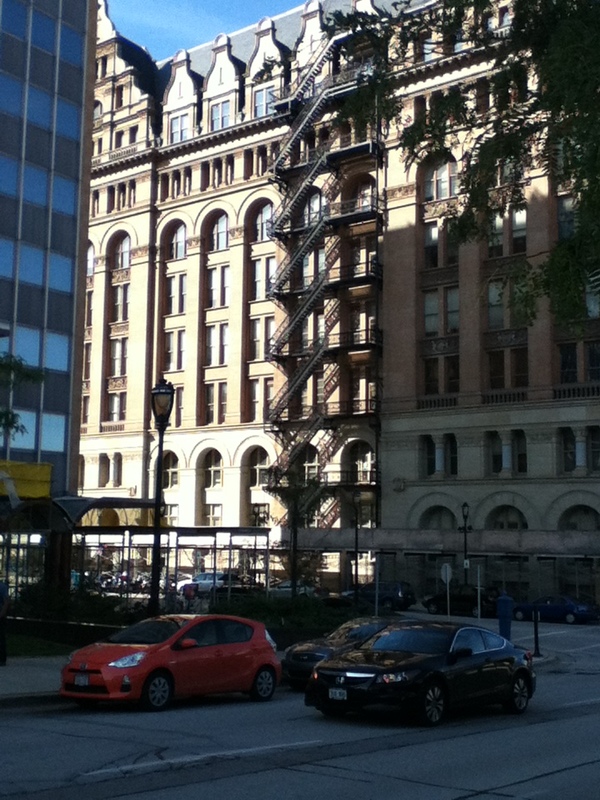 This entry was posted in architecture, Art, Life, Milwaukee, Nature, Science, Technology and tagged architecture, City Hall, fire escape, historic preservation, iconic architecture, Lake Emily, Milwaukee, Milwaukee City Hall, Northwestern Mutual Life. Bookmark the permalink.